Today we joined a long list of other NGOs to receive financial support from Minister Helena Dalli, Minister for Social Dialouge, Consumer Affairs and Civil Liberties (MSDC), for our work at the EU level. Through the Civil Society Fund the Ministry enables civil society organisations to be active players in our respective sectors, thereby bridging the gap between EU-level policy-making and Maltese grassroots realities. We’ve been benefitting from the CSF for a number of years, particularly since we are keen to bring Malta’s migration/asylum realities on the EU agenda, and because we rely heavily on our networks to support our national advocacy, public awareness and litigation activities. Specifically, the CSF contributes to our annual memberships with the Platform for International Cooperation on Undocumented Migrants (PICUM) and the European Council on Refugees and Exiles (ECRE). Through these memberships we receive regular news updates on EU legal and policy initiatives, and attend several training seminars and workshops that are aimed at influencing national and regional laws and policies. The CSF contribution also enables our Director’s participation at ECRE’s Annual General Conferences, offering excellent networking and learning opportunities. Importantly, the CSF also supports Neil’s participation in the meetings of the ECRE Board, where he represents ECRE’s member organisations based in the Mediterranean region. “We’re extremely fortunate that the Ministry supports these kind of civil society activities. On Monday 29 February, together with our project partners MGRM, the Ministry for Education and Employment and the Ministry for Social Dialogue, Consumer Affairs and Civil Liberties, we launched the research report ‘Sensitivity, Safety and Strength: An Inter-agency Review of Malta’s Policy on Trans, Gender Variant and Intersex Students‘. The report was researched in the context of the project that sought to assess the actual impact of the June 2015 national policy on trans, gender variant and intersex students. Two primary goals drove the report’s spirit and methodology: to secure a safe learning environment for all students, and to support the full enjoyment of all their fundamental human rights. With this value approach in mind, our research conducted a series of stakeholder meetings in order to assess the actual impact of the June 2015 policy. A Policy Assessment Tool was designed and presented, largely along the lines of the human rights indicator model promoted by the United Nations High Commissioner for Human Rights. The Tool is intended to be the basis for regular, comparative policy assessments that would identify implementation trends, challenges and actual impact on the intended target groups/themes. We were happy that this project enabled us to to work hand in hand with NGO and institutional partners, on the basis of a common understanding of the need to ensure a rights-based and child-centric approach to this sensitive issue. This is definitely a project implementation methodology that we will seek to follow in other areas. We’ve spent the past few months working on a policy assessment tool that we’ll be using to review Malta’s policy on trans, gender variant and intersex children. The policy was published on 16 June 2015. Running from January to December 2015, this project brings us together as partners with, MGRM, the Ministry for Education and Employment and the Ministry for Social Dialogue, Consumer Affairs and Civil Liberties. The project will conduct a qualitative research exercise assessing the immediate impact on schools of Malta’s new national Educational Policy on Trans, Gender Variant and Intersex Students. Following the development of specific indicators in consultation with policy-makers, the project will base this assessment on attitudes and approaches of schools to trans, gender variant and intersex children and youth, and their families, in order to ascertain the effectiveness and sustainability of the policy. The project’s assessment tool will lend itself to future further assessments for on-going evaluation, as well as possible use in other educational policy areas such as racism. This project is funded by ILGA-Europe, through the Documentation and Advocacy Fund (funding cycle 2014). aditus foundation, Integra, Jesuit Refugee Service Malta, KOPIN and Organisation for Friendship in Diversity presented joint submissions as part of their input into the Public Consultation on the National Migrant Integration Strategy 2015-2020 launched by the Ministry of Social Dialogue, Consumer Affairs and Civil Liberties (MSDC). In our submission document, we outlined our recommendations in order to further develop the identified key areas into a comprehensive national integration strategy. Furthermore, we outlined a number of other sectors that need specific reference in any long-term national strategy on integration, these being long-term residence, family reunification, citizenship, political participation and health. 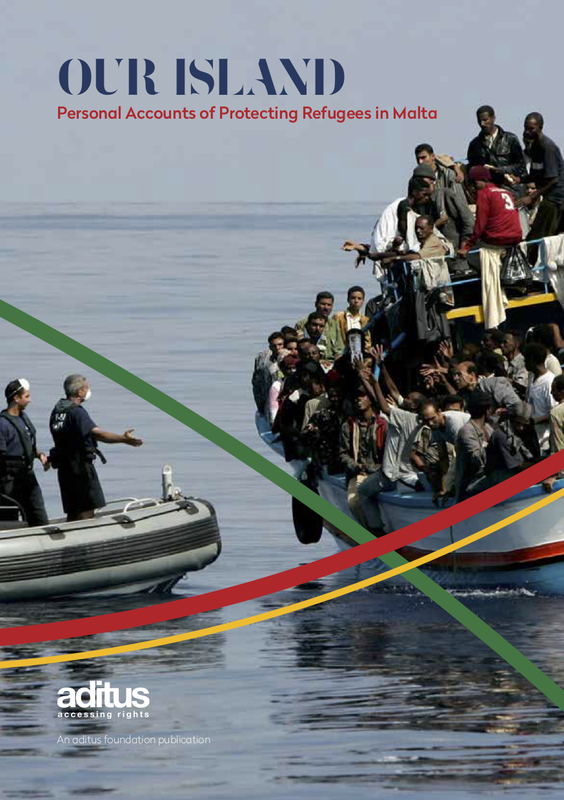 Specific mention was also made of the need to target the most vulnerable migrants including those at risk of extreme poverty, persons suffering from health (including mental) problems, persons with a disability, single heads of households, unaccompanied minors and separated children, and victims of torture, human trafficking or other forms of severe human rights violations. Finally, we recommended that the national strategy should be backed up by valid disaggregated data which must be collected and analysed regularly and that monitoring of such is a key in order to continuously assess the implementation and effectiveness of the strategy itself. Our full submissions are available here (.pdf). It can also be found on our Publications page, under the Policy Input heading. A boost to our Pro Bono Unit! We would like to thank Minister Helena Dalli, responsible for Social Dialogue Consumer Affairs and Civil Liberties, for the financial assistance granted under the ‘Support to Voluntary Organisations Fund 2015‘. The grant will contribute to the strengthening of our Pro Bono Unit, particularly in the context of providing social-legal information and support to migrants and refugees. The services include the provision of information and guidance on accessing legal rights, obligations and procedures as well as social support services. This covers information and guidance on issues such as employment, housing, education, social welfare, remedies for victims, individual support and referrals as necessary. If you need our assistance in enjoying you fundamental human rights, get in touch with us and we’ll see how we can help.